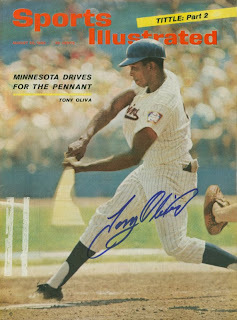 Will Tony Oliva Be Elected To The Hall of Fame? A Return - On Tuesday! More Successes Today - Including Paul Molitor! Will Casey Blake Become a Twin (again)? My older son and I went to the Twin Cities Sports Collectors Club card show at the Valley West Mall in Bloomington yesterday. We did pretty well. 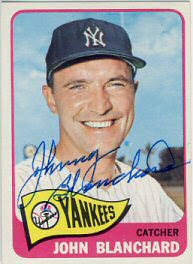 Johnny bought a few newer Harmon Killebrew cards (his favorite player). We also got some Denard Span cards for all of us, including my younger son David. Johnny also picked up a nice World Series program from 1987 for $5. I also got a great deal on three old Sports Illustrated Magazines. 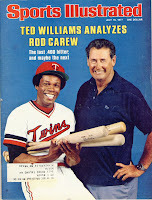 The first is a 1977 with Rod Carew and Ted Williams on the cover. Maybe I'll get this signed at TwinsFest. Although it has a label, it's in good condition and was just $4. 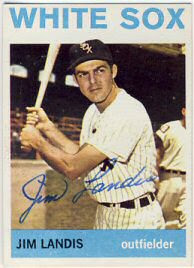 I also bought one from 1961 with Cookie Lavagetto on the cover, the Twin's first manager. It has a label also, but for $3, I couldn't pass it up. 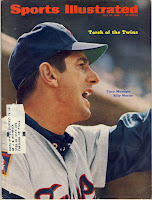 The last is from 1969, with Billy Manager, the Twin's manager at the time, on the cover. Another one in great condition with a label, and only $3. Obviously I can't get the two older ones signed, but for those prices, they are fun to read and will display nicely with the rest of my Twins collection. Despite being the weekend after Thanksgiving, the show had plenty of dealers. I bought about 40 cards from a single dealer who I usually see at this show and the one periodically held at Har Mar. He has a lot of low to mid grade cards and commons from the 50's and 60's at very reasonable prices. I picked up a dozen or so cards from 1960 for $1 each and a couple from 1954 for $2. After the show, Johnny and I ate too much at Famous Dave's, then went home to join the rest of the family in our search for this year's Christmas tree. 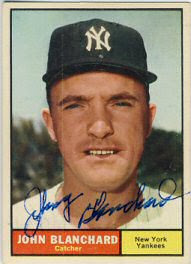 Johnny Blanchard was a third string catcher for the Yankees in the 1950's and 1960's. 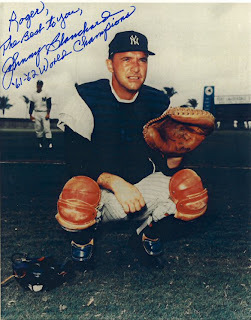 Despite being a backup catcher, he saw lots of action when Yogi Berra and Elston Howard were injured. 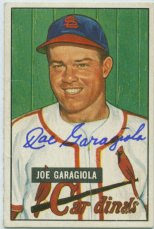 He played in five World Series for a total of 15 games and batted .345 with two home runs. As I looked up his address to send my request, I found he lives in the Twin Cities area of Minnesota, and was born in Golden Valley. 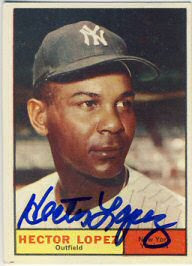 He signed my 1961 and 1965 Topps and also included a signed and personalized picture. He even sent it back in his own envelope which required additional postage. I included $10 with my request as I noticed on SCN that many people were including $5 per card with their requests. That was a nice return, but I'm still waiting on my Frank Viola bobblehead and 1965 Topps from Whitey Ford. My check to Whitey Ford was cashed, so I'm hopeful that will be returned soon. I haven't seen the check to Frank Viola clear yet, so hopefully it's just a Thanksgiving delay. Did you head to the stores today? I didn't. I checked out the ads and didn't see anything worth fighting the crowds for, or that I couldn't order online for the same price or less. I thought the retailers were supposed to be desperate this season, but it doesn't look like it so far. I've got my eye on a couple different digital cameras and if the prices go low enough, I'll buy one, but I don't really need one so I can afford to wait. I would just like a smaller one than what I have to make it easier to take pictures of my kids at autograph signings. I also want it easier to use than what we have because we often mistakenly have the camera set to "P", "A" or some other ambiguous setting and the pictures turn out poorly. I think the wheel on the top of the camera gets moved taking the camera in and out of my wife's purse, my pocket, a backpack or wherever we stuffed it. Anyway, I was pleasantly surprised to see a return in the mailbox today. 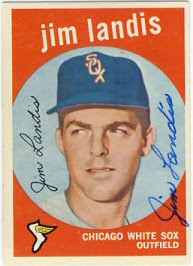 Jim Landis returned a 1959, 1961 and 1964 Topps that I had sent on November 12th. I only have about a dozen requests out right now so things might be slowing down a bit. Next week I'll order some supplies for TwinsFest. Probably four full sized bats, a dozen mini bats, a dozen baseballs, and whatever cards we can find. I'm still looking for a good 8x10 of Denard Span. No returns today. Depressing. Starting to get a little nervous about some of the items I have out. I sent out seven more requests early this week so I should have some returns next week. I read an article today about the Veterans Committee ballot for the Hall of Fame. The vote will be announced December 8th. The article highlights some impressive accomplishment for Oliva: 8 All-Star appearances in his first 8 years, 3 American League batting titles, a Gold Glove Award and The Sporting News AL Player of the Year twice. 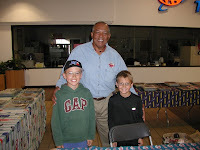 My kids and I have met him several times and he has always been very nice. He has also signed through the mail for us. We would be very happy to see him elected, although I think it has been a while since the Veteran's Committee elected anyone. I was prepared for an empty mailbox today, but was pleasantly surprised to find a return waiting for me. No, not the Frank Viola bobblehead, not the Whitey Ford 1965 Topps, and not Mike Mussina. 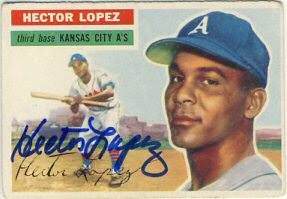 But, I did get back Hector Lopez on a 1956 and 1961 Topps. I have written to Mr. Lopez before. 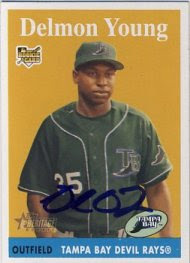 He is in the 1958 Topps set that I collect and he signed his card from that year back in 2003. 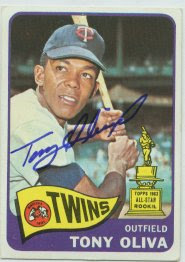 He also has a card in the 1965 Topps set, and he signed that card for me back in April of 2006. He was kind enough to wrap the cards in a piece of the letter I sent him, to protect them on their return to me. Very kind. Well, actually my son John got back the Molitor success. We can't remember exactly when he sent it, but we think it was last April. We were very surprised to see it since we had forgotten all about it. Anyway, it's a really nice addition to his collection. 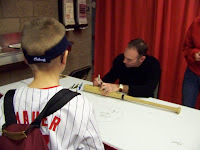 John also had Mr. Molitor sign a bat at TwinsFest last year. I got back three successes today. 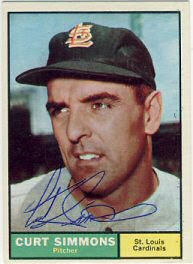 Jerry Davie signed a 1959 Topps. 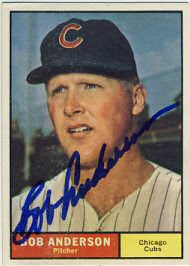 Bob Anderson signed a 1959 and 1961 Topps. 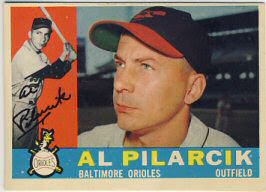 And Al Pilarcik signed a 1958, 1959 and 1960 Topps. I was really hoping to find either my bobblehead from Frank Viola or 1965 Topps from Whitey Ford, but hopefully those will show up later this week. Like my Mike McCormick return from yesterday, some signers personalize your items. Some collectors consider this a failure rather than a success. They think this lowers the value of the item, which I suppose it does. Some collectors like it though, as it shows the player signed it specifically for them. 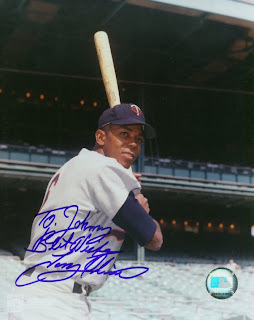 My son likes having his items personalized, and has even paid extra to have an item personalized, such as the Tony Oliva picture shown here. I suppose players personalize for several reasons. I have read that some do it purposely to lower the value of the item so the person requesting it can't easily turn around and sell the item on eBay. Some players probably assume they are doing the collector a favor and that a personalized autograph is preferred to simply a signature. I don't have a strong preference, but I guess I would prefer just the signature. I'm not disappointed when an item is personalized, but since the vast majority of my collection isn't personalized, a plain signature would be more consistent with the rest of my items. I guess the worst scenario would be if my writing were illegible and the person signing my card personalized to a name other than mine. 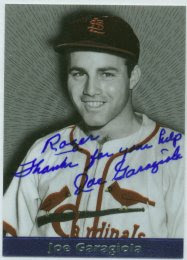 Joe Garagiola will sign your item with just his signature, then include an additional item that is personalized to you. Perhaps that's his way of trying to please everybody. I was definitely happy with it. Today was a big day for returns, more so for my son. He received a ball signed by Johnny Bench which he had sent back in August. He ponied up the $40 fee and was starting to wonder if he was ever going to see it. 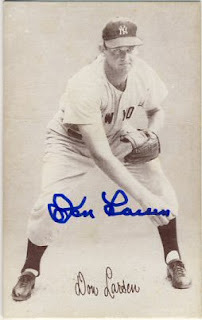 He also got back Don Larsen on an old Exhibit Card (pictured). I got three returns today. 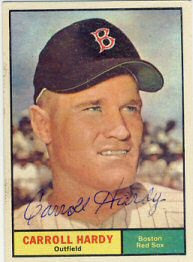 Carroll Hardy signed a 1959 and 1961 Topps. 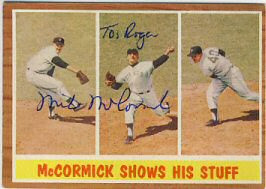 Mike McCormick signed and personalized a 1961 and 1962 Topps. 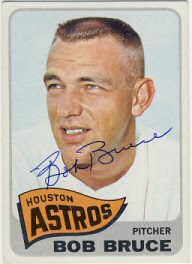 Bob Bruce signed a 1961, 1965 and 1966 Topps. I'm starting to try to get organized for TwinsFest. I'll need to order some bats and start trying to locate cards and 8x10s. I might need to order another dozen baseballs too. I'll probably order the baseballs and bats from Anderson KPT. Today I got back 6 returns. 5 of them successes, and 1 failure. I'm not sure why, but I sent Matt Batts a 1954 Topps and it was returned in my sase unsigned. No note or explanation. Hopefully he is healthy and doing well. I'll watch the returns on SCN and if I see more successes, I'll resend. Maybe it was a mistake. I received 11 signed cards in the 5 successes. 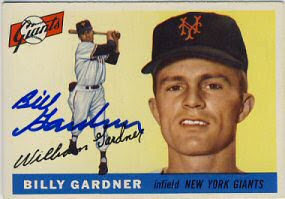 Billy Gardner signed a '55 and '59 Topps. Mr. Gardner is a former manager of the Twins. 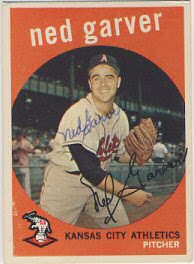 Ned Garver signed a '58 and '59 Topps. 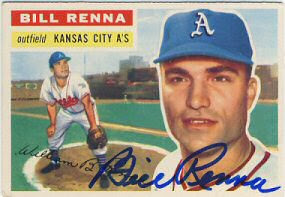 Bill Renna signed a '56 and '59 Topps. 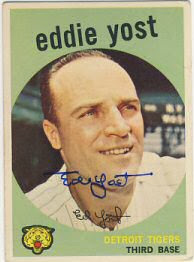 Eddie Yost signed a '56 and '59 Topps. 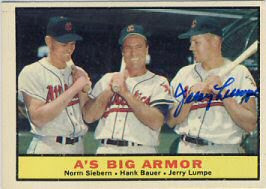 And finally, Jerry Lumpe signed a '61 Topps, '61 Topps "A's Big Armor" and '64 Topps. I also received my new laptop today. It's pretty big, which is fine because I don't carry it around much. The 17" screen is great, as is the full size keyboard with number pad. I haven't used it much but booted it up, registered it and got the wireless connection working. I'll play with it more tomorrow. Hopefully, I'll have a few more successes tomorrow as well. I'm especially looking forward to getting back the bobblehead from Frank Viola and I have a couple of longshots I sent recently. I sent a card to Grady Sizemore last Friday. I have seen many successes on SCN lately, so hopefully I wasn't too late and he's still signing. I also saw that Mike Mussina is signing. He just announced his retirement and is in the news a lot. Hopefully he isn't so flooded with requests that he stops signing. Well, I didn't get the big flood of returns that I expected today, but I did get back two: I received a 1961 and 1962 Topps from Gary Bell, and 1959 and 1961 Topps from Curt Simmons. 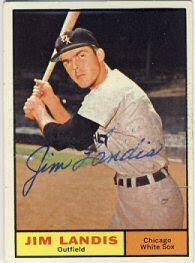 While I don't really concentrate on the 1961 Topps set, I do have about 150 of them signed. Since I collect the 1958 and 1965 Topps sets, many of those players are also in the the 1961 set, so I include those in my requests as well. It's a pretty inexpensive set, but some of the pictures are pretty dark and aren't ideal for autographs. I also finally got my old laptop working again, but only after uninstalling XP SP3. It took quite a while too, probably since that old laptop is so old. My new one arrives tomorrow. I received a recorded call from UPS this evening letting me know it would arrive, and that it requires a signature. They were kind enough to let me know that it would be delivered sometime between 8:00 a.m. and 7:00 p.m. While it's not exactly a ttm success, I received a ball signed by Bob Gibson today. 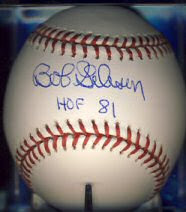 A fellow SCN member, who was volunteering at an event for the Special Olympics in Kansas where Bob Gibson was signing, took other members' items to the event to be signed. I had Mr. Gibson add his "HOF" inscription. This is my 49th baseball signed by a Hall of Famer. 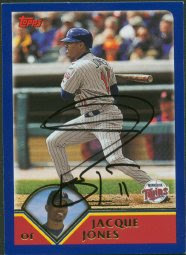 Unfortunately, I didn't get any of my ttm requests back today as I expected. I'm sure tomorrow will be a big day. Thursdays are usually the biggest day of the week for returns. I wouldn't be surprised if I get back 4 or 5 tomorrow. I'm not sure why, but I almost never get any ttm requests back on Tuesdays. It's almost a given that, regardless of how many requests I have out, the mailbox will be almost empty on Tuesdays. I did get a couple of bills, and the regular assortment of advertisements, but no autographs. Maybe it has something to do with the days I mail my requests out. I think I'll have to analyze this further when I have time. I record each request in a spreadsheet, noting who I sent to, what general address ("home", "c/o Detroit Tigers", etc), what I sent them specifically, the date sent, date received, and the result. I track what I sent because sometimes I get back different cards, extra cards, or sometimes fewer cards. I also track all of my requests on sportscollectors.net, to share the information with other collectors. My first successful request was sent to Jacque Jones on June 23rd, 2003 and received back on June 27th, 2003. Probably my fastest response too. On Saturday, I mailed my 1620th request. Let's see, suppose each letter had an average stamp price of 40 cents, and since I include a self-addressed stamp envelope in return, that's 80 cents per letter, for a total of about $1300 in postage. And that doesn't include the balls and photos which are more. We'll say $1500 in postage. Yikes. That's a lot of money for "free" autographs. Each letter I write is handwritten. As are each envelope and return envelope. It's a wonder I haven't suffered some carpal-related malady. When I used to write dozens of letters a week, (before my kids were in baseball, hockey, Cub Scouts and music lessons) each day when we pulled up to the mailbox my kids and I would guess how many autographs would be waiting for me. I think my record was 9 returns in one day. 2 to 4 was usually in the ballpark. Except Terrible Tuesdays. 0 or 1 would be a good guess. I didn't get my notebook fixed last night. I still can't get the wireless card and XP SP3 to play nice together. I got the blue screen of death in the process. My wife twisted my arm just enough. Today, I ordered a new HP Pavilion from Best Buy. It seemed like quite a bargain. I also was able to buy a new wireless router for half price with this purchase, so this should get me back into "recent" technology. I think my existing Toshiba laptop is about 7 years old. It has served me very well and I've gotten my money's worth, but it's time to upgrade. Hopefully I'll have some returns to share tomorrow (after I get back from my kids' hockey practice). Today I finally got back some ttm (through the mail) requests. 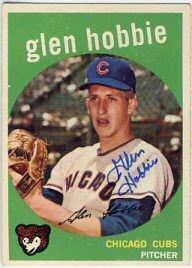 Glen Hobbie signed a 1959 and two 1961 Topps cards in a very quick 5 days. 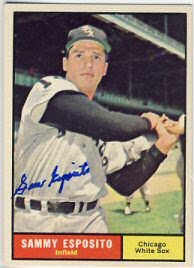 Sam Esposito signed a 59 and 61 Topps that I mailed out on 11/6. Bill Henry signed a 61 and 65 Topps for me which I also sent out on 11/6. I expect to start getting quite a few more later this week and I also bought a few more cards on eBay to send out, although I' not sure when I'll have time to write those letters. I planned on writing a few last night, but after installing Service Pack 3 for XP on my laptop, my wireless card quit working. I spent 2 and a half hours trying to get it operational with no luck. I'll spend some more time on it tonight. About the only interesting chatter I'm hearing from the Twins is the fact that they're showing some interest in Casey Blake. The Twins are one of 8 teams that are showing an interest in him, so if it becomes a bidding war, the Twins will surely lose. 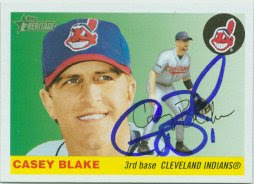 Casey signed this 2004 Topps Heritage for me through the mail during the 2005 season. Blake is from Iowa, and I've read that he is interested in returning to the Twins organization. Blake was with the Twins before being released twice, once in 2001 and again in 2002. I actually don't remember him being with the Twins. According to his stats on mlb.com, he played in 29 games split between the 2000, 2001 and 2002 seasons. Blake is 35 years old, so this seems like another attempt by the Twins to find an aging player to resurrect his career with the Twins, such as Brett Boone, Craig Monroe, Livan Hernandez, Eddie Guardado, etc, etc, etc. I'd prefer to stick with Brian Buscher at third, even though he's a left-handed batter and I think the Twins want some more righties in the lineup. 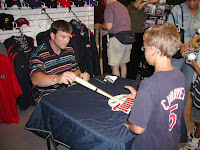 This picture is of Brian Buscher and my younger son, at a signing at the Twins Pro Shop in Apple Valley in July of 2008. We'll see if this interest turns into any action. If Blake doesn't work out, maybe the Twins will call Mike Schmidt or Brooks Robinson. 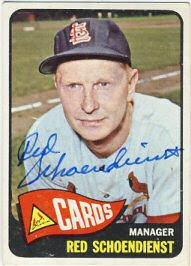 Through a contact on Sportscollectors.net, I was able to get a couple more 1965 Topps signed for a reasonable price. This person has a contact that works at one of the big shows, and is able to get cards signed at a discount. I got Willie McCovey and Red Schoendienst. 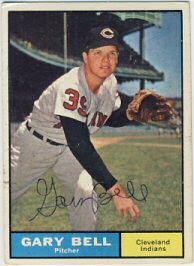 I was trying to get Juan Marichal as well, but he had to reschedule so I'm hopingI'll get that one signed in February. 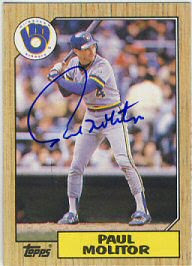 I also sent in a 1979 Topps card for Ozzie Smith, but he couldn't get that one signed. 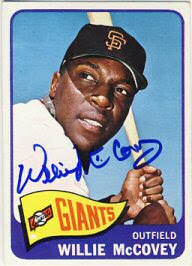 I still have a 1965 Topps out to Whitey Ford and I'm a little surprised I haven't gotten it back yet, it's making me a little nervous. I included a check which has not yet been cashed. I sent out over 20 letters this week so I should start seeing quite a few returns towards the end of next week. Well, I finally got around to packaging up the bobblehead for Frank Viola from the 1987 Twins set. I'm a little nervous about mailing it because if it's lost or broken, I don't know how I'll replace it. It's a little more complicated to mail than cards or even a ball. I use two priority mail boxes, a smaller one inside with my address as the "to:" address, and a larger one that will contain the other box to be shipped off to Florida. My older son also wanted to get a ball signed so I am sending that along with another donation. It will probably cost about $16 shipping there and back. This year's off-season (a.k.a "Hot Stove League") is a little boring for the Twins. No potential blockbuster trades like last year when Johann Santana was on the trade block. But there are some moves that need to be made. Nick Punto and Adam Everett have filed for free agency, leaving a few holes in the infield. Neither offer a tremendous amount of offense, but both are solid defensively and Punto is Mr. Web Gem. There is talk of needing a bigger bat to add to the infield, most likely at third base. With Tolbert, Buscher, Harris and Casilla, there seem to be enough infielders already. Punto seems like the logical choice as a utility infielder, if he's willing to take that role. There's been some talk of trading Cuddyer to get a big-hitting third baseman. I really like Cuddyer and would hate to see him go. I'd rather trade Delmon Young who really doesn't appear to be playing up to his potential. With Gomez, Span, Cuddyer and Kubel, the Twins seem to have plenty of other outfielders. We'll just have to wait and see what happens. The "Home Plate" channel on XM Radio is definitely less exciting than last year. 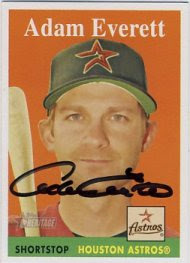 The cards shown in this post are all from the 2007 Topps Heritage set. I really like them because they are styled after the 1958 Topps set which I also collect. 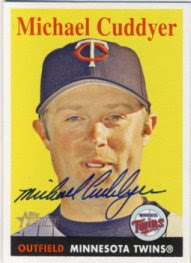 I received the Cuddyer card through the mail last season. I got Young and Everett to sign these cards at TwinsFest last year. 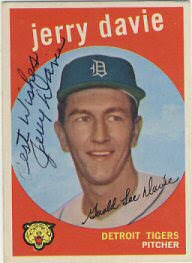 Like Duke Snider, Al Kaline is another Hall of Famer who is an excellent signer through the mail. 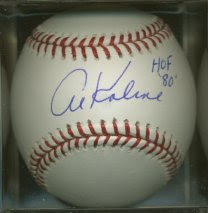 I have several items signed through the mail by Mr. Kaline. I always send the items in care of the Detroit Tigers, as he is almost automatic from that address. I include $5 for cards, and $10 for larger items, such as baseballs or magazines. 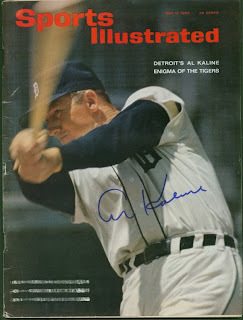 There are a lot of great old magazines with Kaline on the cover. 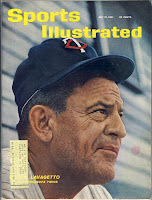 I have a Sports illustrated from 1964 with a great picture of him swinging on the cover. 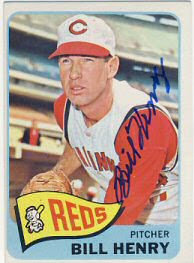 There's another with him and Denny McClain as Denny got his 30th win in 1968, which I have been meaning to buy and get signed by both of them. 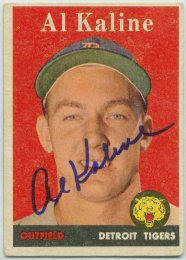 Like Snider, Al Kaline is an autograph that every collector should have in their collection.